Regarded as one of the top college arenas in the nation since opening its doors in 1969, the Jon M. Huntsman Center has provided an imposing home advantage for Utah teams the past 47 years. 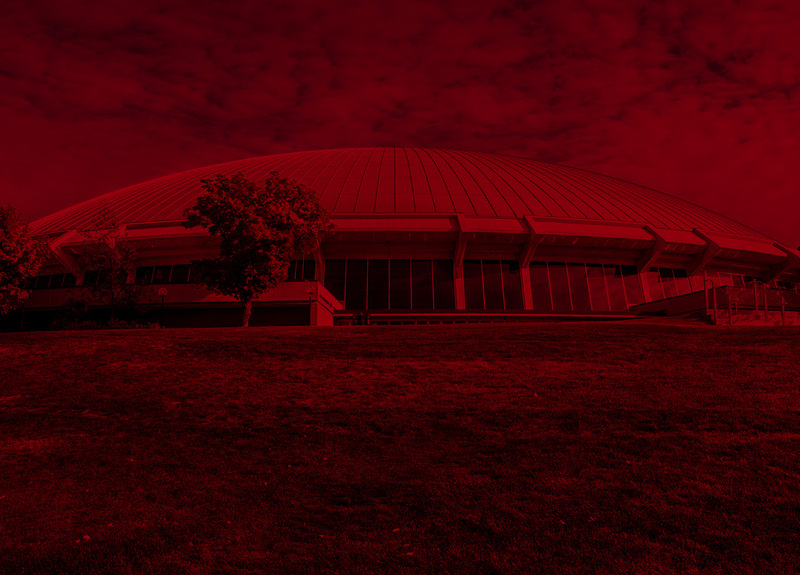 A landmark on the U. campus, the Jon M. Huntsman Center is the perfect place to watch a sporting event. With 15,000 chair seats (8,400 for volleyball and women's basketball with lower bowl seating only) assuring a great view from anywhere in the arena, the Huntsman Center is the largest venue in the Pac-12 Conference. New to the Huntsman Center in 2017-18 were a newly-designed center-hung video display system, four new corner boards hung from the ceiling structure and four boards on the walls of the lower bowl, totaling $4.1 million. The Huntsman Center underwent a $6 million renovation in the summer of 2014. The original ceiling cloud was replaced with a super grid structure. Energy efficient LED arena lighting, which accommodates instant on and off, was installed. A new state-of-the-art sound system and ceiling mounted sound panels provide greater clarity. The project also included a draping system, offering a more intimate setting in the arena's lower bowl for smaller events. New banners were hung to honor Utah's all-time greatest teams and retired jerseys, and a maple wood floor was installed with an updated graphics and color scheme. The locker rooms have also been renovated in recent years, funded in part by donations from former Ute basketball All-Americans Andrew Bogut and Andre Miller totaling $325,000. Underground tunnels stretching 2,220 feet connect the arena with the four-building HPER complex, which underwent a renovation before the 2015-16 season. The $36 million project included the new Jon M. and Karen Huntsman Basketball Center, which houses the men's and women's basketball programs, and the Sorenson Legacy Foundation High Performance Center, a state-of-the-art sports medicine and strength & conditioning facility. The Ute volleyball team has made the Huntsman Center its permanent home since 2013. The largest crowd to watch a Utah home match is 4,637 fans against BYU on Sept. 14, 2017. The Utes averaged 2,017 fans per match in 2017. The Red Rocks led all women's sports in regular-season home attendance in 2018, averaging 15,139 fans. Utah has won eight all-women's sports attendance titles (2010, 2011, 2013, 2014, 2015, 2016, 2017, 2018)—including six straight—as well as 34 gymnastics attendance crowns. Utah's 15,244 average attendance in 2017 set the NCAA all-time record. Utah has averaged more than 14,000 fans a meet for the past 10 seasons. Utah once went 24 years and 170 meets (Feb. 20, 1979 through Mar. 23, 2002) without losing a dual meet. Including postseason competition, the Utes have won 95 percent of their home meets. More than eight million fans have watched the Runnin' Utes in the Huntsman Center, where the team is 593-145 (.803) all-time with winning records in 42 of the last 43 seasons—including eight undefeated campaigns. Utah attracted a total of 216,914 fans for an average of 12,051 per contest in 2016-17. The Utes have drawn more than 200,000 fans inside the Huntsman Center in each of the past four seasons. Utah women's basketball has won 500 games in the facility (.835 winning percentage), ranking in the top 20 among active NCAA Division I arenas. The Utes have had nine seasons without a loss in the Huntsman Center and recorded a 28-game home winning streak from Jan. 12, 1995 to Feb. 8, 1997. In 44 seasons, the Utah women's basketball program has only had two losing seasons at home. The Jon M. Huntsman Center has been long recognized as a site of NCAA Championship events. In men's basketball, the Huntsman Center ranks third among the nation's arenas for the most NCAA Tournament games hosted, with 81 contests having been played in the facility. The JMHC played host to the 1979 NCAA Basketball Championship “Dream Match-Up” featuring Indiana State's Larry Bird and Michigan State's Magic Johnson. The men's NCAA regional tournament came to the Huntsman Center twice (1971 and ‘81). First and second round games took place 13 times (most recently in 2006). The JMHC has hosted NCAA women's basketball first and second round games twice (2001 and ‘11). Also a famous women's gymnastics venue, the Huntsman Center has hosted a record nine national gymnastics championships—one AIAW and eight NCAA Championships (most recently in 2007). Utah has also hosted 14 regional meets (most recently in 2018) and two Pac-12 Championships (most recently in 2015). Women's basketball has hosted NCAA tournament first and second round games in 2001 and 2011. The NCAA women's volleyball tournament visited the Huntsman Center for the first time in 2017 with the Utes winning the Salt Lake Sub-Regional.